DATRON rotary axes are used for accurate multi-side machining of precise mechanical parts. Small electrodes, circular engravings, or also jewellery moulding are typical examples of application areas for these rotary axes. All DATRON rotary axes are supplied with an integrated servo positioning unit and auxiliary software. Our machines can also be retrofitted with rotary axes without any problems. The massive unit consists of a horizontally aligned swivel axis in a U design, which supports the compact rotary table with a face plate diameter of 135 mm. 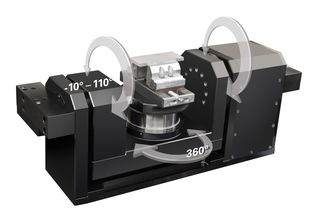 Five workpiece sides can be machined in one set-up. The DATRON control also supports complex five-axis simultaneous machining here. 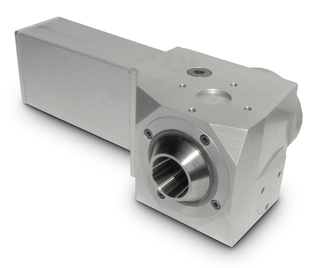 This DATRON rotary axis is characterised by an especially high-quality structure, very high resolution and a maximum of backlash freedom. It offers high holding forces, e.g. for taking up clamping fixtures. Available in a single-turn or multi-turn design. Robust gears running in an oil bath allow for low-friction operation and provide long-term reliability.